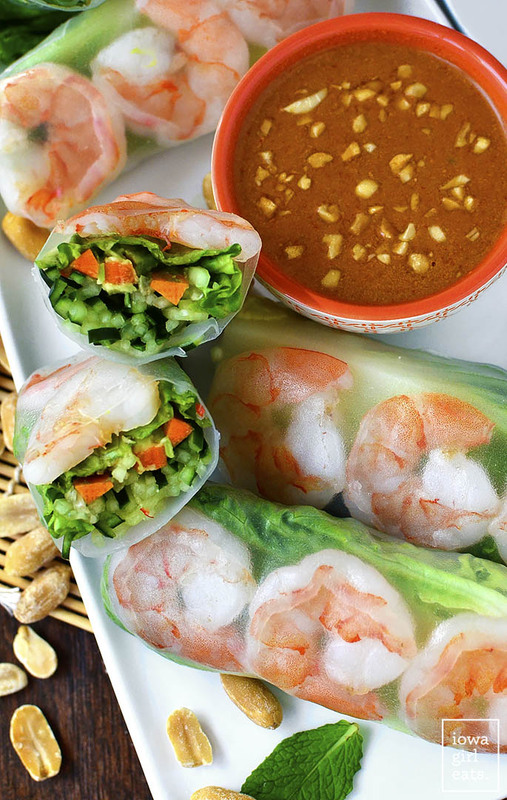 Fresh Summer Rolls with Spicy Peanut Dipping Sauce are light, crunchy, and healthy, and paired with a craveable yet easy dipping sauce! 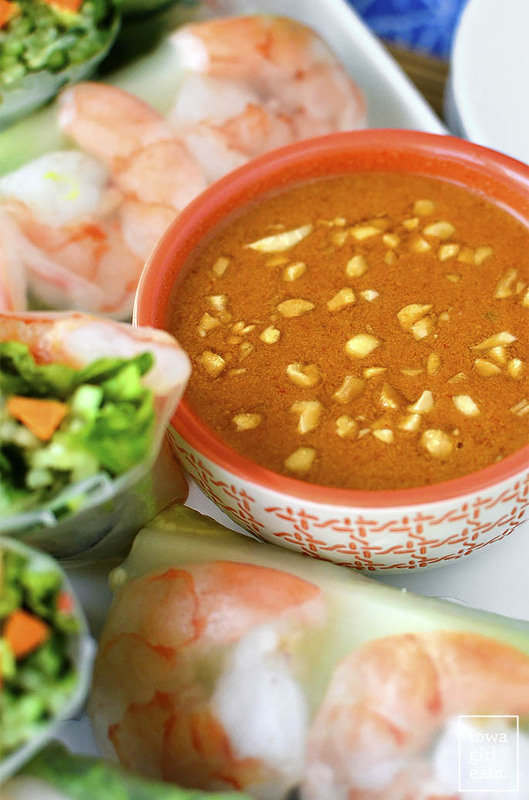 Forget ice cream cones, beers, and brats – Fresh Summer Rolls with Spicy Peanut Dipping Sauce are going to be your warm weather JAM over the next 6 months! Oh, who am I kidding? I seriously considered procuring meyer lemons online after seeing a friend show off her homemade Buttermilk Meyer Lemon Ice Cream on Facebook earlier this week, am imagining new ways to kick myself for not buying more Sociable Cider while we were in Minneapolis last month, and, well, this whole episode…’nuf said. Seriously though, Fresh Summer Rolls are already becoming a staple in our house as we continue to seek light and healthy spring recipes that are packed with fresh vegetables! If you’ve never had nor made summer rolls at home, you are in for a TREAT. 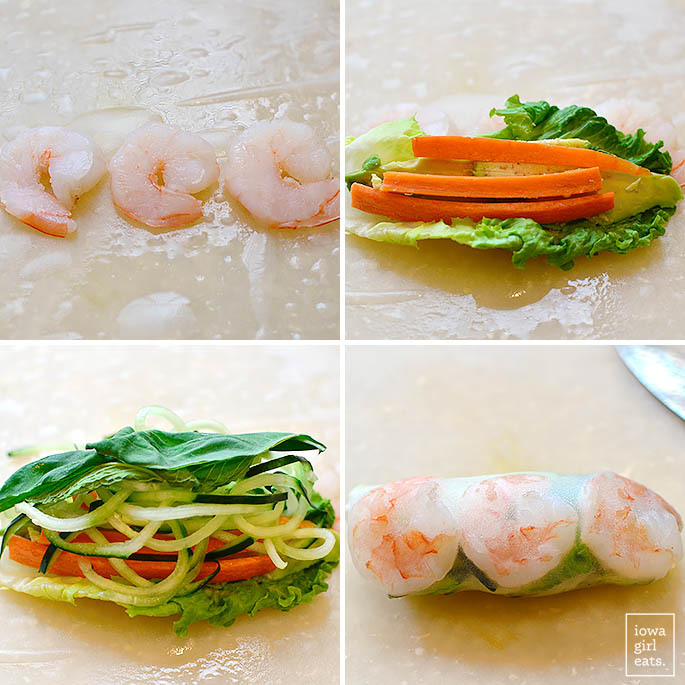 Chewy rice paper wrappers envelop shrimp and garden-fresh fillings including lettuce, avocado, carrots, fresh herbs, and the ingredient that makes these particular summer rolls super unique – spiralized cucumber instead of rice noodles! Rice noodles are actually one of my favorite parts of summer rolls but to be honest, sometimes I get pumped about making summer rolls at home until I remember I have to prepare the damn noodles. It’s a whole nother thing that I’d just rather…not. So, in its place I used spiralized cucumber which adds THE most amazing crunch and freshness to these rolls. Total upgrade from rice noodles, if I do say so myself! Don’t worry if you don’t have a spiralizer – I’ve included modifications for you. 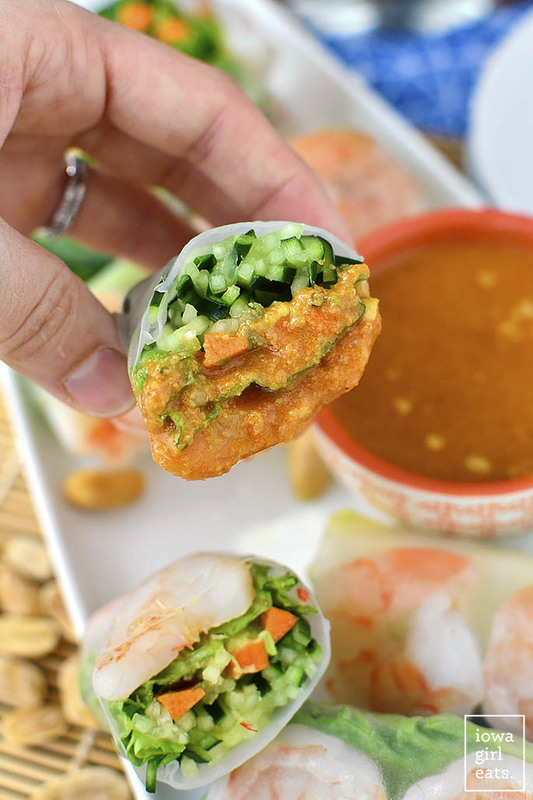 What takes these Fresh Summer Rolls from good to great though, is the four ingredient Spicy Peanut Dipping Sauce I serve them with, which Ben and I have resorted to pouring onto each new bite. #restraint The sauce’s spice level is easy to adjust up or down depending on your tolerance, and man oh man, I’m telling you, the fresh herbs paired with the peanut sauce in particular will make you feel like you’re dining at your favorite Thai or Vietnamese restaurant with each bite. I’ve made 20+ Fresh Summer Rolls over the past couple of weeks while recipe testing (wish I was kidding,) but Ben and I have had zero problems wolfing them down because they leave us “sushi full” vs “I hate myself” full (Google Louis C.K. “Eating Habits” if you need an explanation, though it is NSFW nor FTFOH (for the faint of heart!)) ? Fresh, healthy, crunchy, creamy, light, and flavorful – you’re going to adore these rolls! Start by spiralizing 2 small, thin cucumbers using the thinest blade on your unit. I have a Paderno Spiralizer and love it – I also love the fact that I don’t need to mess around cooking rice noodles for the filling of the rolls and can keep them packed with vegetables instead. 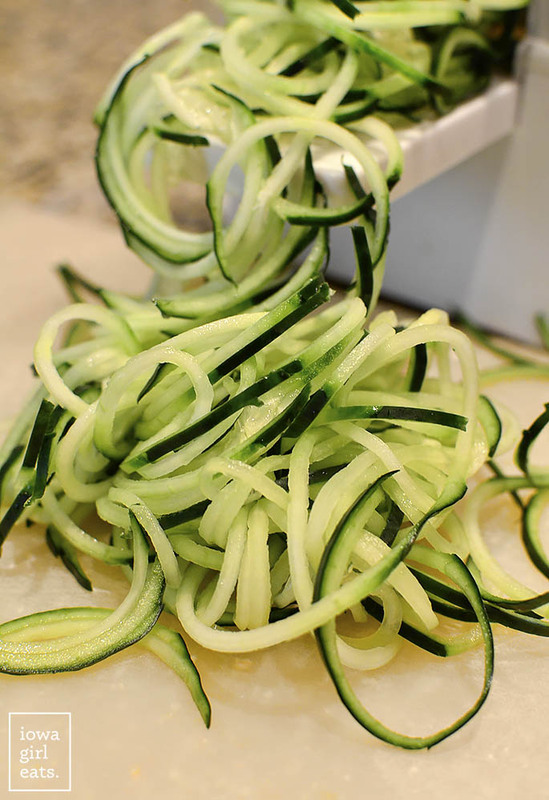 If you don’t have a spiralizer, no problem, just peel then seed the cucumbers, and then cut them into thin sticks. Transfer the spiralized cucumbers to a colander to drain while you prep the rest of the ingredients – you’ll be surprised by how much water comes out! Next cook 15 jumbo shrimp that have been peeled and deveined. 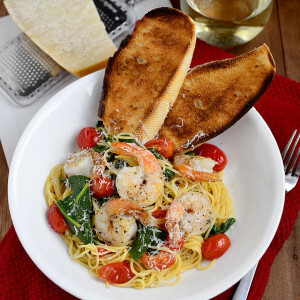 Drop the shrimp into salted boiling water for 1-1/2 minutes, or until cooked through, slice in half widthwise, and then chill. 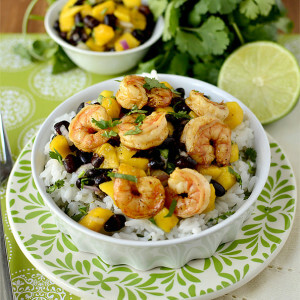 I’ve tried this recipe with smaller shrimp that I kept whole but they slipped and slid around when rolling. 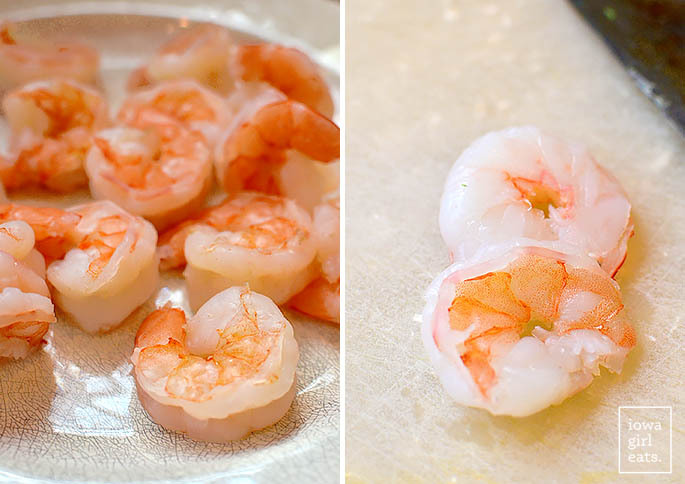 16/20 count jumbo shrimp (meaning there’s between 16 and 20 shrimp per pound,) sliced in half make for nice and stable base for the roll. You’ll see! Next pluck 20 leaves each mint and basil (cut basil leaves in half it they’re large,) peel then slice 2 carrots into matchsticks, and thinly slice 1 avocado. As I mentioned, I really, really love the combination of mint and basil in these rolls – so refreshing and distinctively “summer roll”. Last step is to separate the leaves from 1 small head green leaf lettuce. 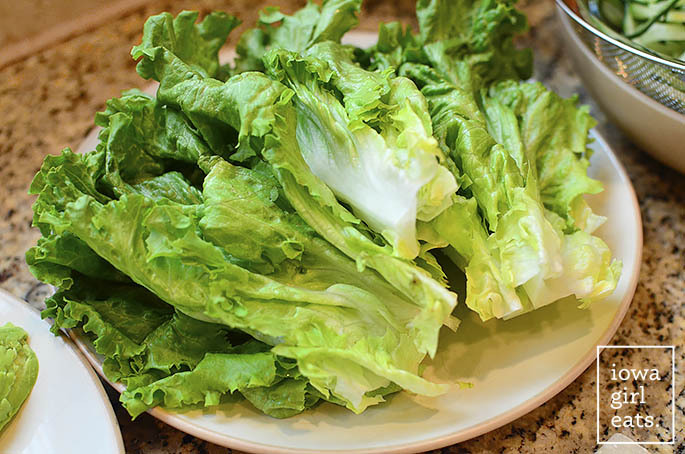 This is just your run of the mill green leaf lettuce found at any grocery store. Alrighty, time to wrap the rolls, starting with 10 rice paper rounds. I found this brand at my local Asian market (central Iowans: check out the one in the East Village across from Miyabi 9,) but you can order them online too. They’re insanely cheap and easily found gluten-free! 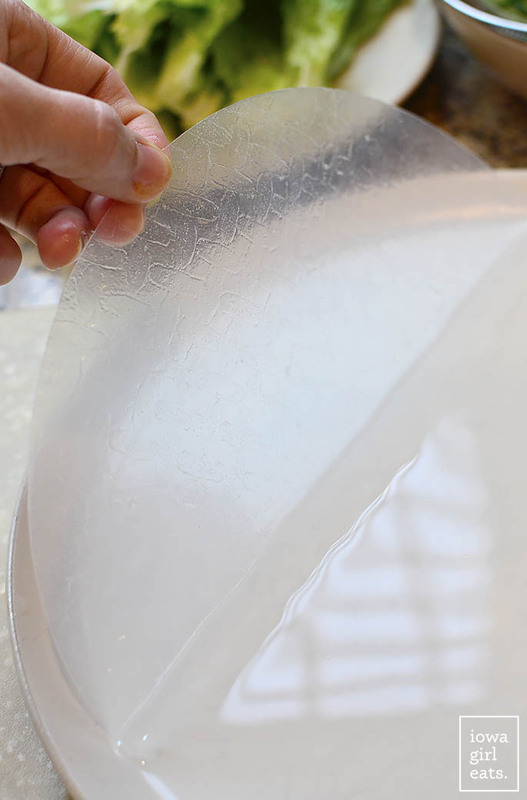 Rice paper rounds are textured and firm, and need a 10-15 second soak in hot tap water to become pliable. You want the wrapper to be pliable but not soggy when transferring it over to a cutting board to fill – you’ll see what I mean when you’re doing it! In the center of the rice paper wrapper place three shrimp halves cut side up for pretty presentation then place a piece of lettuce on top, trimming if it extends past the shrimp. Fill the lettuce leaf with a couple slices of avocado and carrot, plus two leaves each fresh basil and mint. Finally, add a small handful of cucumber noodles then tightly stretch the bottom half of the wrapper over the top, pull the sides over, and then wrap like a burrito. Rice paper wrappers stretch and hold more than you think, so don’t be afraid to really wrap them tightly. After all the Fresh Summer Rolls have been wrapped, whisk together the super easy Spicy Peanut Dipping Sauce that I want to bathe in. Ahem. That’s just 1/4 cup coconut aminos or gluten-free tamari (or soy sauce if not GF,) 1/4 cup peanut butter, 1 Tablespoon rice vinegar, 1 Tablespoon siracha chili sauce (or more or less – I used Lee Kum Kee brand,) and 2-3 Tablespoons hot water to reach your desired consistency. Spoon into a serving bowl then GO TO TOWN!! Add shrimp to a pot of salted, boiling water then simmer for 1-1/2 minutes or until cooked through. Drain, slice in half widthwise, then chill. 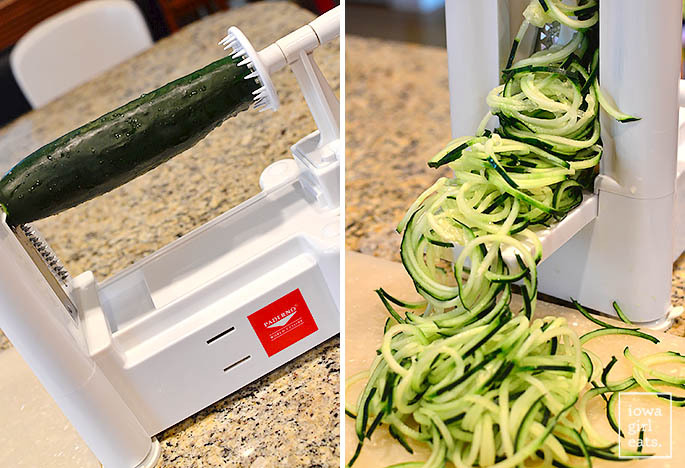 Fit Spiralizer with the thin noodle blade then spiralize cucumbers with the peel on. Transfer noodles to a strainer to drain excess liquid while prepping remaining ingredients. Alternatively you could peel then seed a cucumber, and then cut into sticks. Whisk together Spicy Peanut Dipping Sauce ingredients then taste and adjust rice vinegar and/or chili sauce if needed, adding more hot water to achieve desired consistency. 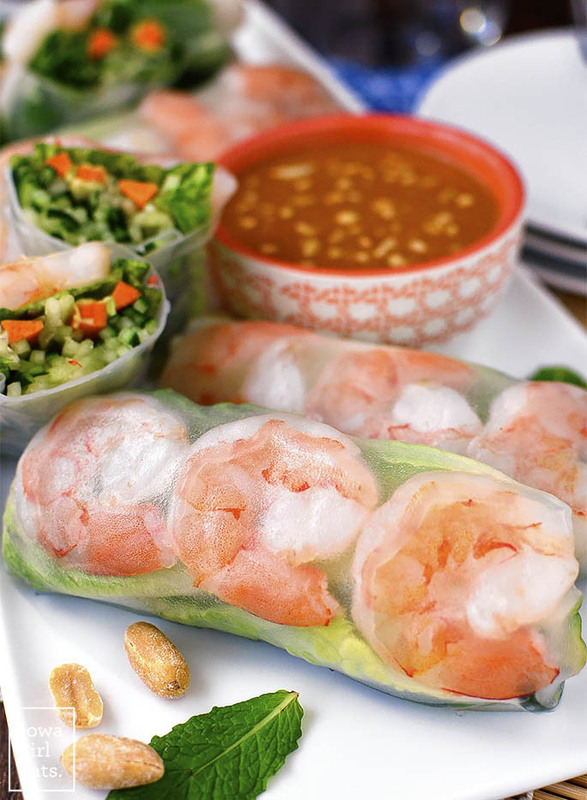 Serve with Fresh Summer Rolls. 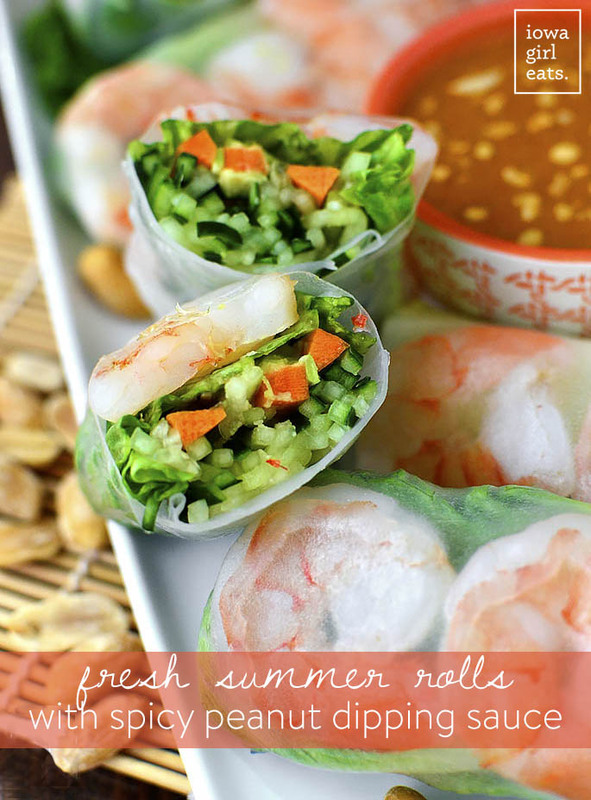 The next time you get a summer roll craving, I encourage you to try rolling them at home vs going out to a restaurant. You’ll love how fresh and simple they are, plus no upcharge for extra dipping sauce! ;) Enjoy! It’s that peanut dipping sauce that’s getting my taste buds in a tizzy. I think I’ll be using it for more than just this recipe. Never made spring rolls before, I kind of thought that was something you HAVE to hit up a restaurant for. But you’re building my cooking confidence here. If I pull this off, I’ll be amazed! 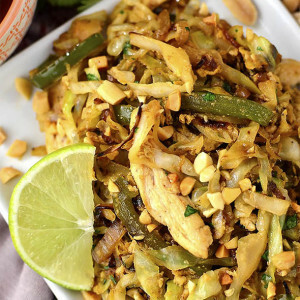 I’m with you on the rice noodles – mine always turn into a gooey mess! This light dinner looks soo good. Plus the restaurants always skimp on the shrimp, this way you can stick it full of them and have a few extra on the side! Yum! I am totally going to do this and swap the mint for cilantro!! Would you recommend eating these immediately or do you think they’d hold up in the fridge for a day or so? They will hold up! The wrappers get a little bit tough the longer they sit, but definitely still edible and delicious. they look amazing! 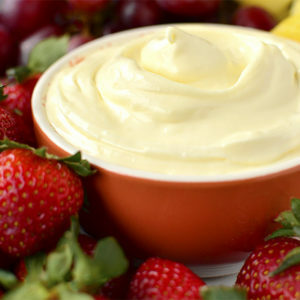 so light and fresh and yummy! do they keep well in the fridge? 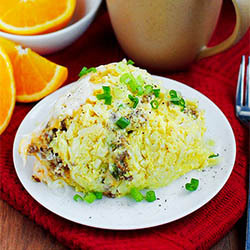 I’d love to make them and enjoy for a few days of work lunches. 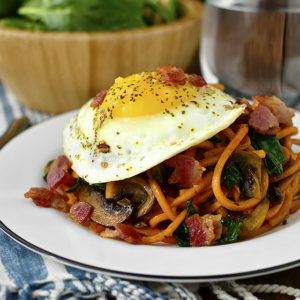 Can you post some more spiralizer recipes? I bought the same one and haven’t gotten it out yet. I need some inspiration! Hi Jen! 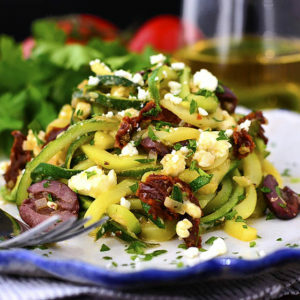 Check out http://inspiralized.com/ – ALL spiralizer recipes!! You knocked another one out of the ballpark Kristen! I have GOT to try these! I want to try your peanut sauce!! Yum!! I love making summer rolls!! These look so good! These look so fresh and yummy! 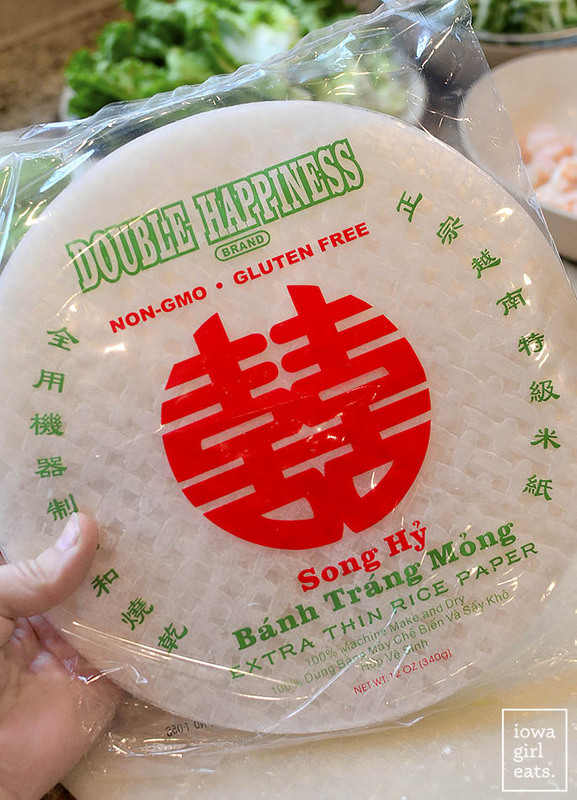 I love me some rice noodles, but the few times I have tried to make them at home, they turned out like rubber bands :/ will be trying these for sure! Ok, a comment about nothing that has to do with this recipe. We made your chicken chili with green chiles in the crockpot yesterday and it was SOOOO good, even though I think my husband put twice as much chicken in it. I have another white chicken chili recipe that is amazingly delicious but way more work so we hardly ever have it. This is a great and healthier substitute. Just wanted to give some positive feedback! I LOVE making spring rolls. So easy, so yummy and can make a big batch to last a few days or to share! I never thought to spiralize my cucs – so doing that next time. I wish I had time to make these now! I made these last night for my husband and I to take for lunches this week (I made some with shrimp and some with rotisserie chicken and also added a few fresh slices of jalapeno to his because he likes the spice). I got the following email a few minutes ago from my hubs, “Those spring rolls were DELICIOUS!” I so agree. I’m already excited about lunch tomorrow!! This was my first foray into making spring rolls (and buying rice paper Wang’s Asian Market ftw) and now I feel like I am basically an Asian chef. Plus that peanut sauce? I could eat it by the spoonful! Once again your recipes have inspired me to try making something I would’ve never thought to make before. Thank you and keep up the great work!!! I am not only thrilled that both you and your husband loved the rolls, but that you learned a new kitchen skill! Thank you so much for the great feedback! Summer rolls are one of my favorite foods. So glad the weather is finally warming up so I have an excuse to eat them! These look great! Thanks for the recipe. This recipe jumped out at me because I knew I had some rice paper wraps in my pantry that needed to be used up! I think the problem was that they’d expired (I’m not even going to admit when…) because they totally ripped apart when I was rolling them up. Argh! Never mind though because I just turned the filling into Fresh Summer Roll salads and used the delicious peanut sauce as a dressing! 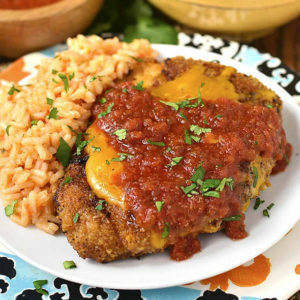 I used everything in your recipe plus some cilantro which I already had….and it was still a total winner for both me and my husband! Thanks! Love the idea of making this into a salad, Amanda!! Sounds absolutely delicious!